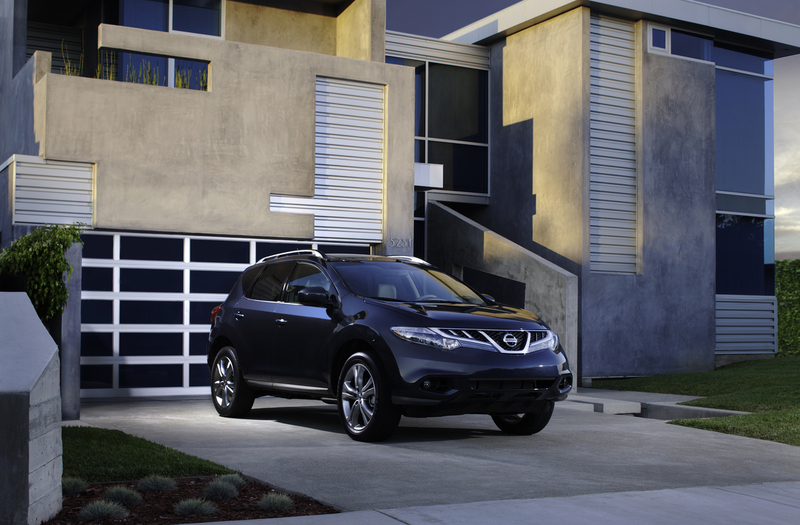 The tested dark metallic blue Murano started at $38,000 and ended up $40,855 with mainly a navigation system upgrade adding to the price. If price is a concern, start shopping at the S level, which begins at $29,960 for front-drive and $31,560 for AWD. There are four trim levels, the top, LE, going for $40,560 with AWD. Murano, like most crossovers, is fairly easily accessed. Not a big step-up here as in most utes. It’s quiet inside and will haul a fair amount of stuff, plus 4 to 5 adults. Cargo space is a generous 31.6 cubic feet behind the second row seats. That’s more than in a Honda Pilot. But fold the seats down and Pilot wins by a long shot. Front and rear seat legroom and headroom are good, but this one does have a dual sunroof that eats up an extra inch or so of headroom. Tall family? Forget sunroofs! Murano’s 111.2-inch wheelbase and four-wheel independent suspension makes it a comfortable ride, both on highway and around town. Bumps are well muted and its Dual Flow Path shocks on all four wheels eat up rough roads. Likewise most folks will appreciate its silky 260-horse 3.5-liter V6 and how it meshes with the Xtronic CVT (Continuously Variable Transmission). As stated in my other Nissan reviews, this is the only CVT on the market that I’d recommend. It works near perfectly with the V6 to provide good low-end power and also not deafen you with high-revving engine noise. Many CVTs do neither. While I found the CVT worked well in the new Altima I drove recently, I also got great gas mileage (30+ mpg) in the sedan, not so much with Murano. I managed 18.3 mpg while the trip computer was saying 20.4. The EPA says you’ll get 18 mpg city and 23 highway in this 4,132-lb. crossover. I ran about 60% city miles. Handling is good, with a moderately heavy steering feel, and fairly responsive turn-in into corners. This feels closer to a sedan than a sport-ute and that’s a plus. There remains a little lean in tight cornering and the crossover rides on 18-inch tires. Braking comes from four-wheel vented discs. There also is stability and traction control, and the AWD system that will keep you on the straight and narrow once the winter slush returns. 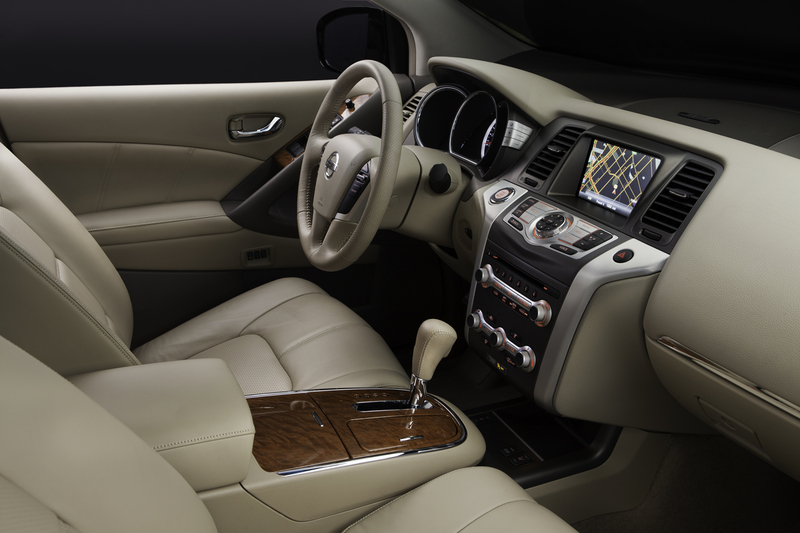 I like Murano’s interior. It’s well insulated from road and wind noise and this one had a tan and brown leather interior with brushed metal look trim around the stack, shifter, console and doors. Its three round intertwined main gauges are easy to see and most buttons and dials on the stack are simple to use and understand. There’s two-memory seat buttons in the driver’s door, plus a power hatch and fuel-release door button on the left dash. That’s also where you’ll find the heated steering wheel button. Love the heated wheel in winter. Also love the two-level seat heat and Murano’s comfortable mildly contoured seats that make for enjoyable long rides. There’s a power lumbar support too for the driver. While I like the seats, again I’d like to see the driver’s bottom seat cushion’s angle power adjusted so you can lower the seat’s front edge, a benefit to shorter legged drivers. A leather wrapped steering wheel features radio, cruise and phone buttons on its hub. Officially this is a tilt/telescope wheel, but the test vehicle’s wheel would not tilt at all, appearing to be jammed at a mid-level setting. That meant that as I adjusted the seat up to a height where I was comfortable I could Not see the top of the speedometer. Odd. There’s push-button start too, plus a docking port for your key fob, a welcome addition for those of us who prefer a place for store the key/fob. The buttons are large on the Nissan navigation system. To adjust the trip computer there are buttons on the right edge of the gauge pod’s hood. Radio channel selection buttons are below the touchscreen navigation and radio, a better arrangement than in the Altima, which had tiny on-screen channel buttons that were hard to select. All the main map, info and radio buttons surround the large, and rarely needed, center master control knob. These buttons are large and easy to use while driving, as were the radio volume and tuning knobs. Dual climate controls also are standard here. 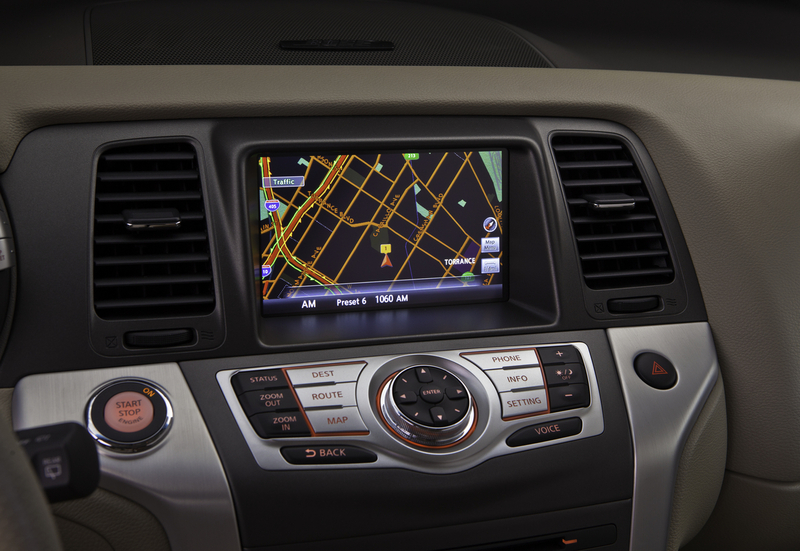 The test car added a $1,880 navigation package that provides a large touchscreen, plus voice-recognition and real time traffic and weather info. Nice if you’re on highways a lot. There’s a HomeLink system overhead too. 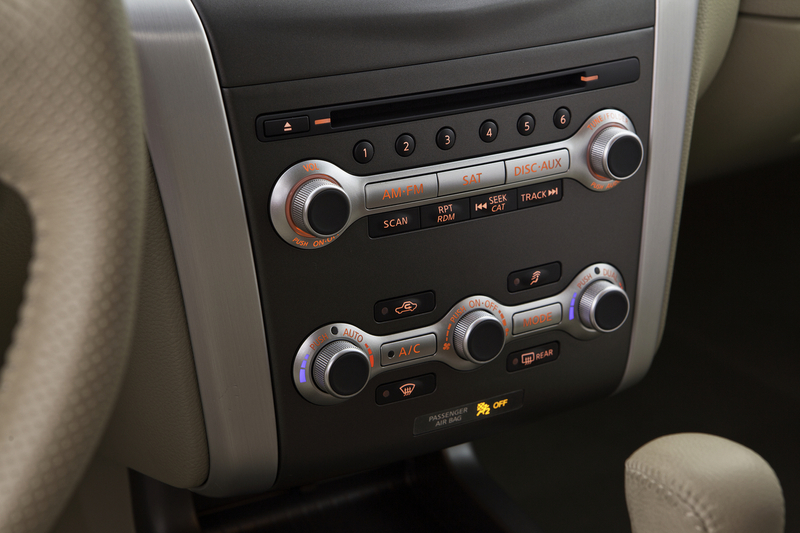 The Murano’s climate control knobs are easy to use and stylishly laid out, along with the radio knobs and buttons. Very symetrical too! Overall, Murano is a pleasantly styled crossover with good interior room and design, plus a comfortable luxury ride and feel. If pricing is a major concern, focus on the S and SV trim levels. Additionally, if you don’t absolutely demand AWD, you can save some dough by going with a front-drive model. Hits: Smooth acceleration and comfortable ride with quiet interior. Well laid out interior with heated steering wheel, dual sunroofs, 2-level seat heat and power hatch. Misses: Tilt wheel didn’t work, power seat’s front edge angle isn’t adjustable.